Last week CWA President Chris Shelton came out to California to meet with the Union Bargaining Committee. 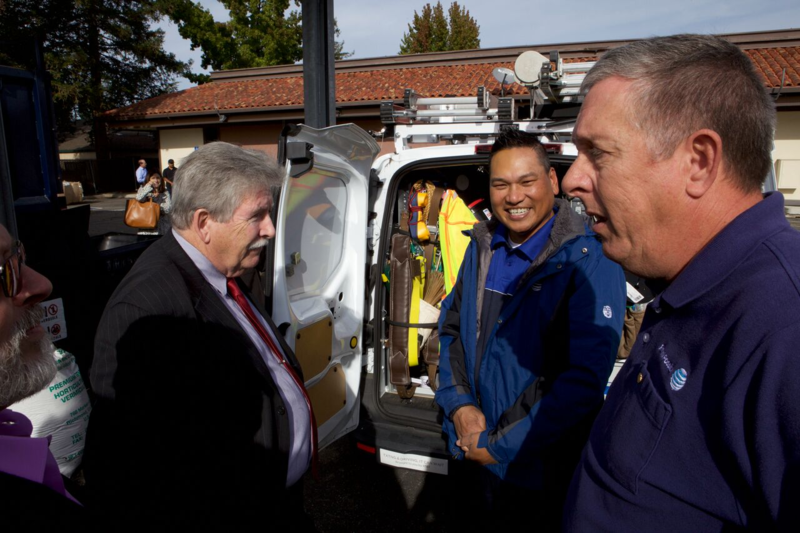 D9 Vice President Tom Runnion and President Shelton, along with the Bargaining Committee participated in a “hands on” Scope of Work demonstration for Premises Technicians in San Ramon. The reason for the demonstration had to do with the Scope of Work that the company is proposing Premises Technicians perform. Afterward, President Shelton and Vice President Runnion along with the Bargaining Committee went to the Pleasanton Yard in CWA 9412’s Local and met with a couple of Prem Techs to get their opinion of what was going on out in the field and the current state of mobilization and bargaining. This week the Union Committee has been meeting in sub-committee on Memorandums of Agreement, Information Requests and Overtime Issues. We are scheduled to meet with the Company tomorrow. At this point bargaining is moving very slowly. It is time for all the Members to step it up and participate in the upcoming MOBILIZATION Activities. Contact your Local Union Mobilizers and ask what you can do to show AT&T you “Stand with Your Bargaining Committee” and tell AT&T you are ready to do what it takes to get a Good Contract! At the core, Labor Unions, (we), are working men and women, unified as one force. Despite any personal differences that may exist between us, we have banded together to protect and improve the lives of workers. We rise up together for the greater good. We defend one another like family.